Through our good friends from e3e5.com we get to learn yet another team that will participate at the Chess Olympiad in Dresden. 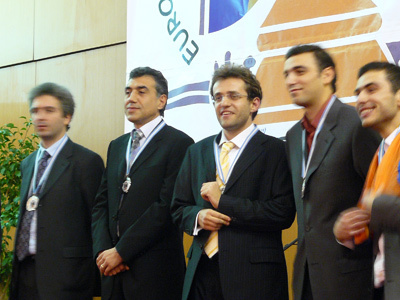 The team of Armenia, winner of the 2006 Turin Olympiad, will have a similar setup to the one they used at the ETCC in Greece, with GM Levon Aronian taking board one. Boards two and three will be for GM Vladimir Akopian and GM Gabriel Sargissian. The honor to substitute the recently passed away GM Karen Asrian will be for GM Minasian and GM Petrosian. The women team will be led by IM Elina Danielian. She will be joined by IM Lilit Mkrtchian, WGM Nelly Aginian, WIM Siranush Andriasian, and L. Galoian.